Subject: Antique Master Print, titled: 'Armand premier theatre Francais.' - Portrait of the actor Armand. Condition: Very good, given age. Ample margins. Some creases and soiling in the margin edges. General age-related toning and/or occasional minor defects from handling. Please study scan carefully. Size (in cm): The overall size is ca. 23.5 x 31 cm. The image size is ca. 23.5 x 31 cm. Size (in inch): The overall size is ca. 9.3 x 12.2 inch. The image size is ca. 9.3 x 12.2 inch. Description: Published by C. Motte, for Courrier des Spectacles. 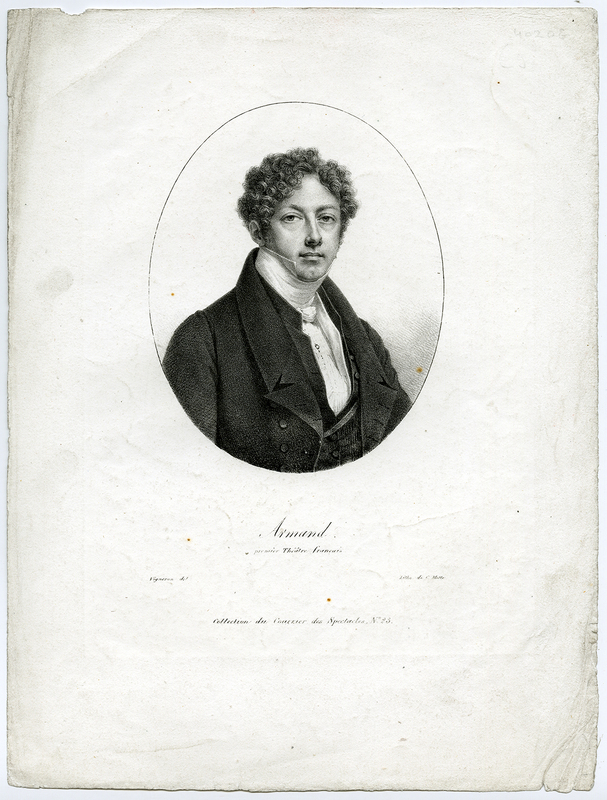 Artists and Engravers: Made by an anonymous engraver after 'Pierre Roch Vigneron'. Pierre Roch Vigneron (1789-1872) was a French painter, miniaturist, lithographer and sculptor. He was a student of Gautherot, Gros and Roque. He mostly worked as a painter of genre subjects.